We are proud to assist you and definitely we are here to help you learn how to drive, but the truth is we do much more than that. Part of our goal is to instill confidence in each driver as well as defensive traffic skills that will help create safer drivers. It is no secret that the amount of car accidents in this country is significant, which drives us to create effective but easy lessons people can learn. It is hard to believe there was a time when people did not have to learn to drive a car, but now it is a vital skill to have, which is part of the reason we have dedicated ourselves to passing on the art of proper vehicle operation. Hialeah Driving School we have done our best to provide real value to those who give us an opportunity to help them reach their goals. Of course, All Classes are Florida State Certified, we want you to be extremely satisfied with our services. Nothing is more valuable knowing that you can rest easy and that you will be getting everything you need from us. ​Please, do not hesitate to give us a call 305-809-8929, or just contact us through our site if you have any questions. You can also just come in to see our team in action before you make your decision. We are happy to help and are waiting to serve you and answer any questions you may have. Our driving school is open from Monday thru Friday to help you with all your driving needs and scheduling. We have English and Spanish classes. We are proud to offer you with internet courses, video/DVD courses. Our bilingual staff can help you choose the best courses for your particular needs. Some insurance companies offer discounts just for taking some of these car operation enhancement classes, so make sure you take advantage of them if your insurance company offers reductions on your premiums. You can simply call and ask your provider if they do not publicize the discounts. No one wants to pay more for insurance, especially with a shaky economy, so every dollar counts and we know that. This is the reason we will do our best to help you through the requirements needed to get you driving as soon as possible. Our driving school in Hialeah not only helps those dealing with the aforementioned violation but also a simple moving violation. These types of violations can also put points on your record and even make your insurance higher. One of the very important and mandatory by the state is the Drug & Alcohol Class. It is mandatory to be able to do the Learners Written Exam. The driving test can be taken here at our location. 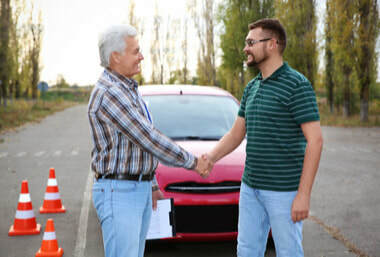 Why Choose our Driving School: Clearly, our instructors and overall mission is to help you get your license, get you back on the road if you got a traffic-related ticket, and get your license renewal completed as soon as possible, but you were probably expecting these things. We want to point out that we offer much more than just prep work for your permit test or that motorcycle handbook you need to pass your test, let's not forget that we also instruct in our facilities DUI programs. Staff that is bilingual so that you can go through our classes through your preferred language, which ensures full comprehension. Our Instructors: You can expect our instructors to help you cope with nerves, which are common in young drivers. This task is achieved through repetition that makes what you learn second nature. Your instructor's job is to help you understand the terminologies used, signage meaning, and hand signals, just to name a few things. You'll also learn about safe traveling by learning a few precautionary skills, like changing your own tire. There is no telling when a flat tire might occur, and you need to have the skills to stop the car safely. The instructor is also going to give you some pointers on how to replace the tire if roadside assistance will not get to your destination for some time. As you can see, our educational programs and our prep classes are meant to create worthy drivers. You can learn more with one click for instant call 305-809-8929 to see what we can do for you. Good Driving Courses: One thing we are proud of is our ability to read each student and personalize their lessons, which should make it easier to obtain their driver license. We believe teens driving does not have to be risky with the right guidance. We guide you through the home drug and alcohol course, which normally takes four hours. Next, we familiarize you with the 50 questions you need to know though you only need to get 40 questions correct on the exam, which you can take here. After passing the exam, you can conveniently schedule your car operation test at our location. It should be pointed out that you will need to bring a car to take your test if you decide to take your test elsewhere, but our establishment provides you with a car if you cannot bring one. This is just one more way we like to make this process easier on you since most teens normally do not have a car. ​Our team is dedicated in making sure you obtain your restricted license permit and license with our driving lessons, but we also want you to become a great driver. Call To Book Your Next Class Today! Time catches up with everyone at some point, and this is something Florida wants you to address when the time comes. This is the reason we also offer coaching for drivers who are 55 or older. At this age, your ability to operate a vehicle may change, and you need to be trained to drive effectively so that those changes do not affect your ability to be a safe driver. Consider the fact that taking these classes will only improve your chances of getting a good discount on your car insurance premiums in accordance with Florida Statute 627.0652. The deduction you are going to be eligible for will vary from person to person. This deduction also depends on what insurance provider you have. The deduction earned is usually only active for three years at which point you are going to have to retake our classes to try to keep the rates low. Hopefully, you like our instructors and are happy to come back, but we have a feeling that you will.